When 1,700 members of United Electrical, Radio & Machine Workers of America Locals 506 and 618 struck at the sprawling Wabtec locomotive plant in Erie, Pennsylvania, Tuesday morning, they got an immediate show of solidarity from one of the most prominent political figures in the United States. That’s the right response from a contender for the Democratic nomination for the presidency. 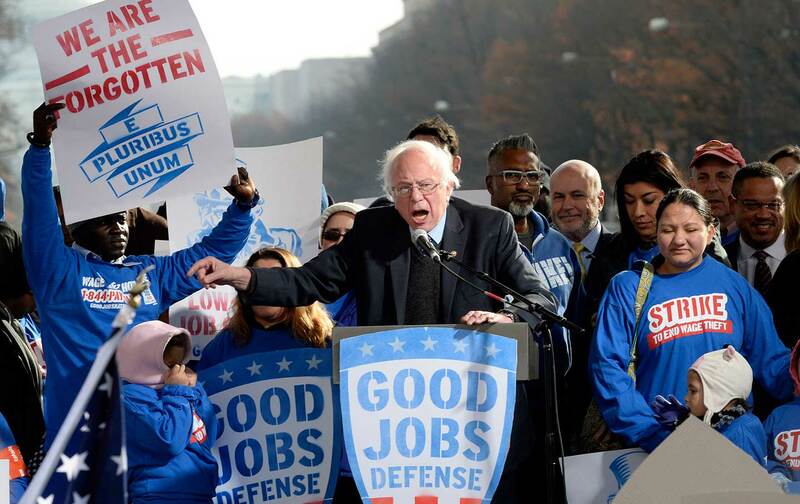 Democrats have to stand in outspoken solidarity with workers, especially when their unions are struggling to preserve manufacturing jobs and maintain fair wages in historic urban and industrial centers such as Erie. Fights over the direction of American manufacturing, especially in the transportation sector, are not romantic struggles to preserve old or dying industries. Locomotive production is booming internationally because of the role that rail transportation is expected to play in a new and more environmentally sustainable economy—and because new technologies are opening up dramatic new possibilities. The question is not whether there will be locomotive production, but whether new generations of workers will get a fair share of the future. The strike in Erie pits a union with deep roots in Western Pennsylvania and American manufacturing against a powerful multinational corporation—Webtec (Westinghouse Air Brake Technologies Corporation)—that, after taking charge this week of a former GE Transportation manufacturing facility, has refused to maintain existing protections for workers. “We are extremely disappointed that the company could not see its way to agree to continue the terms and conditions that we have worked under for decades. Their refusal leaves us with no choice but to go out on strike to protect our members’ and our children’s future,” says UE Local 506 president Scott Slawson. Democrats once went out of their way to align with labor, following the lead of Franklin Roosevelt, who declared two years into his presidency that “It is now beyond partisan controversy that it is a fundamental individual right of a worker to associate himself with other workers and to bargain collectively with his employer.” As the years passed, however, the party’s presidential contenders grew more cautious about throwing in aggressively and consistently with unions as had FDR and the Democrats of the past. Jesse Jackson marched with workers during his Rainbow Coalition campaigns of the 1980s, and candidates such as Jerry Brown and Dennis Kucinich made shows of solidarity during their bids in the 1990s and 2000s. But too many prominent Democrats tried over the years to steer clear of industrial conflicts and fights over labor rights—and more than a few of them broke with labor on issues such as trade policy. Even when prominent Democrats did take the side of labor, they often did so in the stilted language of politicians who sought to avoid offense to potential campaign donors. What distinguishes Sanders is a determination to steer into the struggle. He has a history of joining picket lines and did so during his 2016 bid for the Democratic nomination. He’s actually been to Erie and has appeared with UE union officials and members. The fight for states such as Pennsylvania in 2020 will be about more than particular union fights in particular cities. But labor solidarity has to be a part of the equation.